The biologically distinct, gene expression-based CMS groups of CRC provide a new potential framework for stratified treatment, however, drug discovery is currently limited by the lack of translation of CMS classification to preclinical models. Acknowledging the strong influence of gene expression signals from the tumor microenvironment, an algorithm based on a set of subtype-associated expression markers filtered to enrich for cancer cell-intrinsic signals was developed. The new classifier identified each subtype and their molecular associations among cell lines, organoids and PDXs, showing that CRC preclinical models recapitulate the biological properties of the CMS groups. The classifier is available as the R package CMScaller and can be accessed from https://github.com/Lothelab/CMScaller. High-throughput in vitro drug screening showed that the CMS groups are predictive of response to standard CRC drugs and revealed a potential for drug repurposing. The CMS2-epithelial/canonical phenotype was found to be particularly sensitive to both EGFR and HER2 blockade, also among RAS wild-type cell lines and PDX models. Furthermore, the CMS4-mesenchymal group had poor response to the standard chemotherapy 5-FU, however, drug screening identified HSP90 inhibitors as new effective drugs in both CMS1-MSI/immune and CMS4. A "xenotrial" confirmed a synergistic effect of combination therapy with 5-FU and HSP90 inhibition in CMS4 PDX models. These studies suggest clinical testing of a novel targeted treatment strategy including HSP90 inhibitors, to overcome chemoresistance in CMS4 CRC. CMScaller: an R package for consensus molecular subtyping of colorectal cancer pre-clinical models. Eide PW, Bruun J, Lothe RA, Sveen A.
Sci Rep. 2017 Nov 30;7(1):16618. doi: 10.1038/s41598-017-16747-x. Colorectal cancer Consensus Molecular Subtypes translated to preclinical models uncover potentially targetable cancer-cell dependencies. Sveen A, Bruun J, Eide PW, Eilertsen IA, Ramirez L, Murumägi A, Arjama MA, Danielsen SA, Kryeziu K, Elez E, Tabernero J, Guinney J, Palmer HG, Nesbakken A, Kallioniemi O, Dienstmann R, Lothe RA. Clin Cancer Res. 2017 Dec 14. pii: clincanres.1234.2017. doi: 10.1158/1078-0432.CCR-17-1234. 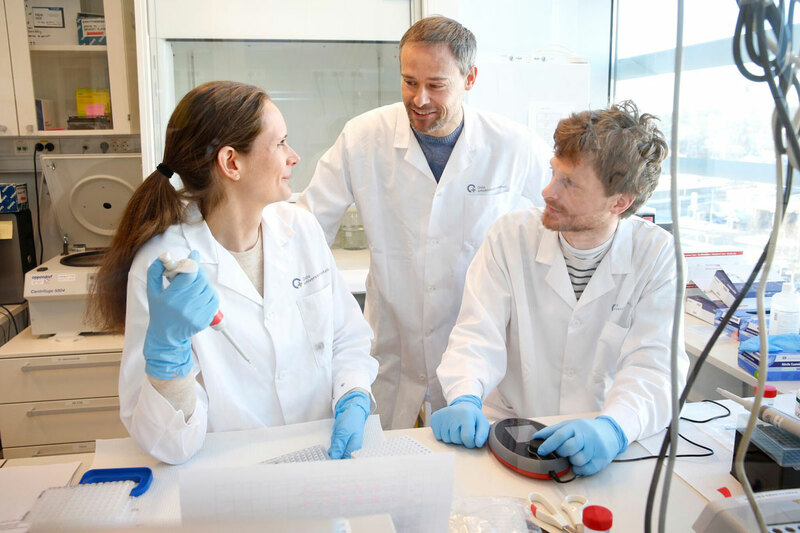 From left: Anita Sveen and Jarle Bruun, with joint first authorship on the Clinical Cancer Report article, and Peter Andreas Wold Eide, first author on the Scientific Reports article.